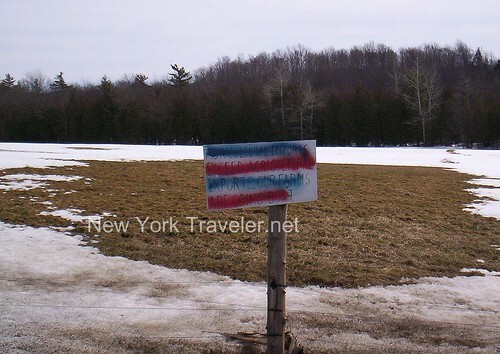 Jordanville, NY, is in the middle of nowhere. Really. I think it is nothing more than a four-corner settlement with a library. But it does have two interesting landmarks that dot the rolling hillsides: a castle and a monastery. We went to see the monastery in the early spring of 2006. 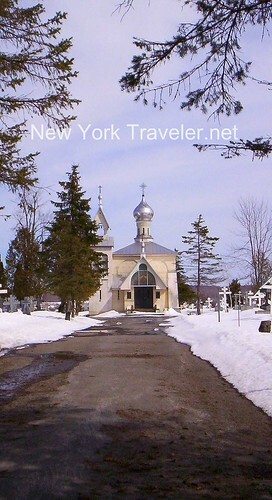 This area of the Mohawk Valley is home to a large number of Russian immigrants, most of whom emigrated to America during times of religious persecution under Joseph Stalin (hiss, hiss). My stepfather was Russian Jewish, so I have a natural interest in Russian history. (My step-dad also said Russian monks made the best wines, and I think he was in part of some kind of Russian wine of the month club, lol). The monastery was founded in 1928. We had hoped to be able to enter the church and look inside. But a sign at the gate forbade women wearing pants to enter. Nuts. We drove around the front and snapped a few pictures. I got a shot of a beautiful mosaic over the doors. The halos above the apostles’ heads are made of gold mosaic tile. Click the photo to see a larger one with more detail. More colorful mosaics were to be found beyond this exquisite gate. I was not bold enough to enter through the gate, but I took this picture. 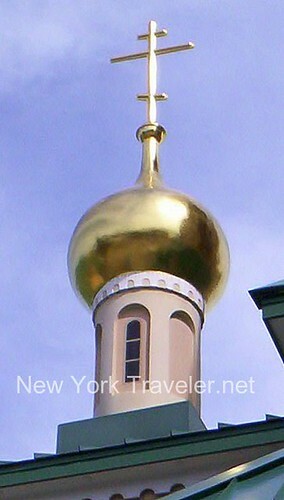 I also took a quick snapshot of the glorious golden onion dome, so typical of the orthodox style. It was a nice visit, even though we did not get to go in the buildings. The kids and I are currently studying ancient world cultures and Church History. We have just finished reading about the fall of the Roman Empire and the invasion of the Northern tribes, and started learning about the formation of the Catholic and Orthodox Churches. It is good to see their artwork and religious style first-hand, rather than relying only on pictures in books. 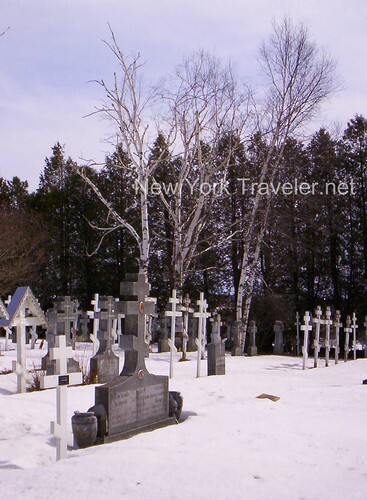 We drove further down the road and came to the monastery’s cemetery. I took a few pictures. The cemetery chapel reminded me of Taj Mahal. On our way back to the main thoroughfare (i.e., Jordanville Rd.) we spotted a swath of signs denouncing the Iraq War. 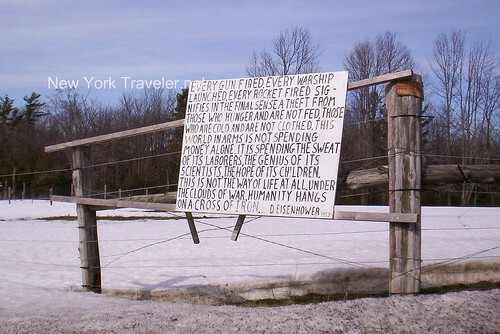 All along his property, a farmer had large signs such as the one below, protesting the war as a “blood for oil” contest. What a gorgeous building. Looks like they have kept it up very well, too. The area is beautiful! Unfortunately, big business wants to use eminent domain and other means to put up useless windmills and power lines all across Upstate. Who knew those Russian fleeing Soviet communism would come to the U.S. only to have to fight encroaching fascism? I have visited this cemetery on several occasions. I have a friend who is buried there. The one thing I have always noticed is how calm and quiet it is there. It is a good place to come and think about things and to reflect on your own mortality. Thank you for publishing the account of your journey. I urge you to visit again to see the inside of the church and the excellent museum they have on the site. If you call in advance, they would be happy to give you and your children a tour. It may seem like nowhere, but the area is rich with history. Much of what happened there was before 1800! There is a property right down the road from the monastery that has been owned by the same family for 300 years! If you love American history, Jordanville and the surrounding area is jam packed with it! I am of a Russian origin, and looking forward to visti this place. The comments go back to 2008, and I am really worried that place has been destroyed (I read articles about Russian Othtodox Church intentions to cell this parcell for the comercial use). Does anyone know anything about the monastery and the church? Would appreciate any information. I have visited the monastery when I lived in the area. I am not of Russian Orthodox decent so forgive me if I offend anyone. It is a great show, the chants, Women on one side and men on the other, no pews. It does have benches when you are tired you can sit on. Very Religious, sometimes the services can go on for hours and they repeat a lot. The monestery has an on sight book store to sell Rusian orthodoxy literature and incense. The grounds are nice to walk around and very peacefull. This place is about 45 minutes to Cooperstown, NY. The Baseball hall of fame. This is a great place to visit. The Otesaga ??? Hotel, the shops, and the sights. Barbara Streisand had a house there where no one should be able to build. There was a nice farmhouse bed an breakfast outside of the area called Hog’s Hollow. Go during the late summer or fall. It is a great time to visit. The monks here are very hospitable. They would have loved to show you their Church (Cathedral) both inside and out. Had you arrived at lunch time, they would have shared their lunch with you. Had you arrived on the day they baked bread, you could have purchased some of the most delicious black bread I have ever had. You have to approach them. They will not approach you. (Russian tradition, at least for monks). Like God, they are there waiting for you to make the first move. I was raised in the 70’s in a house built by my father-less than two miles from the russian monastery. I have very strong visual memories of the buildings, the lands, the monks, and the surrounding russian community. I hold these images very dear-for me, they are mystical. In the summers, my siblings and I would make treks on foot or bikes to Jordanville town to buy popsicles and penny candy at Hoke’s general store. We would pass in front of the monastery, coming and going. I have made drawings in attempts to capture these beautiful memories. 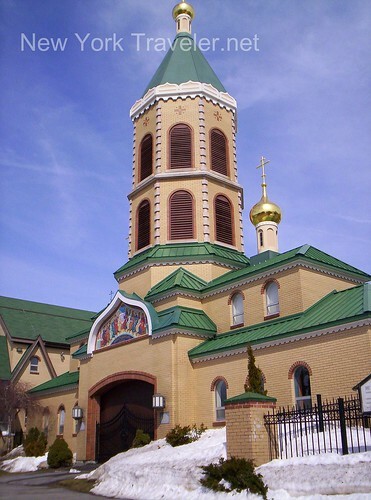 The Jordanville Monastery, a place I grew up visiting about twice a year while growing up, is truly a magnificent place and one of my most favorite places in the world. 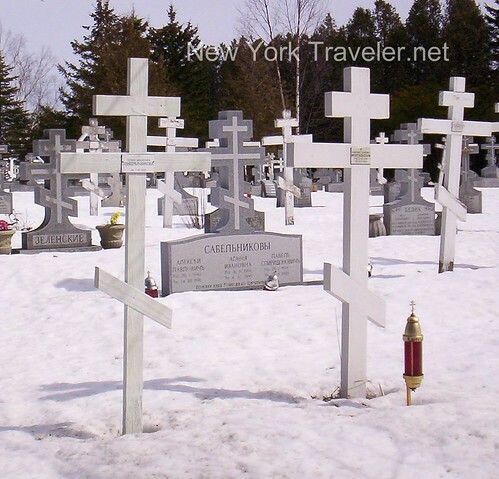 For Rosiland seeking info on Novo-Diveevo, it is open and I have half my relatives buried there. It too is an incredible place. I’ve only gone there for funerals, so I don’t personally know how friendly anyone there is. They used to even have an old folks home there run by nuns: my Grandmother was there for a few years. Don’t know if it’s still there. The Jordanville monks are incredible and if you have a chance, try the monks’ bread: the best I’ve ever had…famous! I remember the smell of the incense they made and I also believe they made candles? i used to live in up state ny. 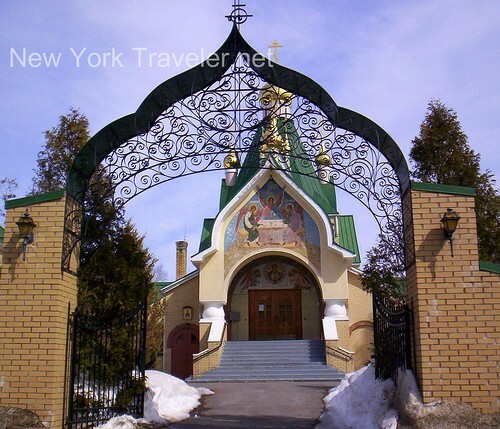 my mom who was russian orthodox would come and visit around easter and reserve a room at the monastery during the easter fast.it was a beautiful drive to the monastery,i remember those times with much love in my heart. it is a beautiful and peaceful place! Visited the monestary today. A seminarian named David gave us a fantastic tour for about an hour. (He grew up in Texas and converted during college in New Mexico. ) He was articulate and very knowledgeable. He gave us lots of interesting factual information, and communicated what his religion means to him personally. My friends and I were very positively impressed by the experience. Note: Women are asked to wear a skirt and cover their heads. If you arrive in slacks they have long skirts that you can tie on. Thanks for your comment, Dale!